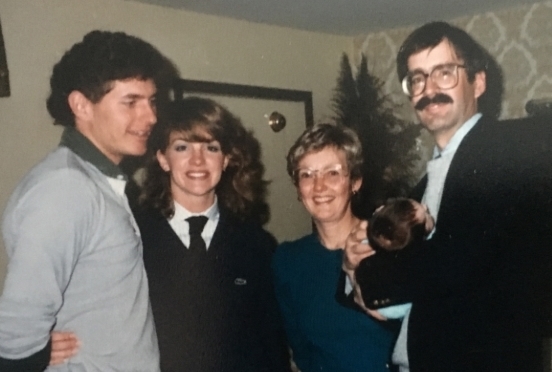 Lauren as a baby with her adoptive and birth parents. Are you an adult adoptee trying to make sense of how adoption influences your identity? Are you wanting to embrace how it's shaped your life, even in the ways it's challenged you? Are you learning to navigate contact and relationships with your biological parents? Are you an adoptive parent who is concerned with helping your child or teen adjust positively as their understanding of being adopted changes? In navigating the world of open adoption, are you trying to manage your own wishes, fears, apprehensions, and boundaries while considering the needs of other triad members? Are you a couple coping with the grief of infertility while starting to embrace the possibilities that adoption brings? Are you pregnant and unsure how to navigate the choices of raising your baby, gifting your child for adoption, or terminating the pregnancy? Whether you're an adoptee, adoptive parent, birth parent, or other person touched by adoption, there are complex and multifaceted issues faced by adoption triad members. When seeking individual, couple, or family counseling for you or your child, It's important to have a therapist who understands the unique experiences of adoption triad members. As an adoptee, my experiences have inspired deep personal exploration as well as professional study of adoption issues during undergraduate and graduate school. I bring great passion in offering an insider's perspective to counseling for adoption issues, while recognizing that every adoption experience is different. I work with adoption issues across all ages, from childhood through late adulthood - it's never too late (or too early) to gain support in navigating past, present, and future aspects of the adoption experience. Discover how to write your own, empowered adoption story. Untangle your personal adoption story from the one belonging to your adoptive and/or birth parents, and then find ways to integrate these multiple narratives. Understand feelings of grief, anger, rejection and ambiguous loss. Explore how society's views of adoption may be impacting your perspective. Navigate questions, insecurities and core beliefs about rejection, existence, sense of belonging, being wanted, being loved, and images of the family that wasn't to be. Find peace with the natural curiosities you may have about your biological heritage. Explore the desire to "see myself" in your family, whether physical resemblance, facial expressions, personality traits, or strengths and interests. Embrace the dichotomy found in adoption. How adoption shapes our attachments - to family, friends, and romantic partners. Guilt and loyalty: experiencing differences in sense of connection to family members. Understand how multicultural factors impact your identity development and positive psychological adjustment. Cope with the pain of infertility & letting go of the dream of the biological child. Explore whether adoption or remaining childfree is the right choice for you. Help your adopted child develop healthy attachment. Blend adoptive, biological, and step-family relationships while respecting differences. Navigate triad member differences in desire for contact between biological/adoptive family members. Discover the right balance of triad-member contact for you family. Help your child in their journey while navigating your own relationship with how adoption touches your life. Processing feelings and reactions to the child's relationship to other triad members. Support your child as they navigate multicultural factors impacting adoptee identity development and positive psychological adjustment.